STATEWIDE—CDOT, the Colorado State Patrol (CSP) and local law enforcement agencies across the state today launched the two-week "Click It or Ticket" May Mobilization seat belt enforcement campaign. In conjunction with the enforcement period, CDOT is encouraging all Coloradans to take the "Li'l Mac Pledge" to always buckle up. The Li'l Mac Pledge is in memory of Mackenzie Forrest, who died in a crash on March 13 when she wasn't wearing her seat belt. Motor vehicle traffic crashes are one of the leading causes of death for Coloradans—and the leading cause of death for teens. In the event of a serious traffic crash, seat belts reduce the risk of death by 45 percent. "As the summer travel season approaches, the May Mobilization effort is critical in keeping seat belt use at the front of people's minds," said Darrell Lingk, director of CDOT’s Office of Transportation Safety. 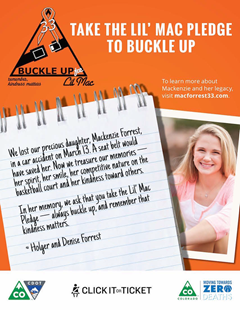 "Too many people die each year because they're not wearing their seat belt, and we are honored to work with Mackenzie Forrest's family to encourage everyone to buckle up in her memory." CDOT, CSP and the Forrest family held an event on Monday morning at the CSP Academy in Golden to encourage Coloradans to buckle up. The event featured the unveiling of Li'l Mac Pledge cards, which will be given out to the public by 40 law enforcement agencies across the state. A group of Mackenzie's friends who took the Li'l Mac Pledge attended the event. "We will never get over losing Mackenzie and knowing the difference a seat belt would have made," said her parents, Holger and Denise Forrest. "But hearing about young people and adults that have now pledged to always wear their seat belts makes us hopeful that future tragedies like ours might be prevented." A new advertising campaign accompanies the statewide seat belt enforcement effort. The ads focus on a simple idea: People around you tell you to buckle up because they care about your safety; law enforcement does it for the same reason. Radio ads about the campaign are also available. "Law enforcement officers are often the first people on the scene of a crash, so they know firsthand what can happen when someone isn't wearing their seat belt," said Col. Scott Hernandez, chief of CSP. "If writing a citation serves as the reminder to always buckle up, then we won't hesitate to do so. We care about the safety of the motoring public, and we will always encourage people to buckle up, every trip." Colorado has a secondary enforcement law for adult drivers and front-seat passengers. Drivers can be ticketed for violating the seat belt law if they are stopped for another traffic violation. Colorado's Graduated Drivers Licensing (GDL) law requires all drivers younger than 18 and their passengers, no matter what their age, to wear seat belts. This is a primary enforcement law, meaning teens can be pulled over simply for not wearing a seat belt or having unbelted passengers. Colorado's child passenger safety law is a primary enforcement law, meaning the driver can be stopped and ticketed if an officer sees an unrestrained or improperly restrained child younger than 16 in the vehicle. In 2014, seat belts saved an estimated 12,802 lives nationwide, including 169 in Colorado. The National Highway Traffic Safety Administration estimates an additional 64 lives could have been saved in Colorado if all unrestrained passenger vehicle occupants involved in fatal crashes had been properly restrained.